If you want a solid, portable little light that you can take to work with you on the construction site, bring along on camping holidays or other outdoor expeditions, use as your emergency back-up light, or car repair light when you break down on the roadside late at night – then we have just the product for you! LED work lights deliver lighting that’s super-bright, energy efficient and long lasting, housed in a compact and lightweight package that you can take it with you wherever you go. Read on as we take you through all the ins and outs of LED work lights – and then review the best models of this sort of light that the market currently has to offer. First, though, a word on LED lighting. LEDs – or Light Emitting Diodes – are a form of lighting technology in which an electric current is passed through a semi-conductor material in order to generate light. This occurs when the current knocks loose electrons from the surface of the semi-conductor material, in the process causing them to release small quanta of light energy known as photons. LEDs are basically a means of converting electrical energy into light energy! And they do this exceptionally well. In fact, due to their superior energy efficiency, longevity, and lower maintenance costs, LEDs are being touted as one of the major solutions to our current set of environmental crises – due to their lower power requirements, they reduce carbon emissions when used instead of older lighting technologies like the incandescent and fluorescent bulbs we are all familiar with. Indeed, LEDs are rapidly phasing out these older forms of lighting technology, and can now be found in all sorts of settings and applications from which they were absent only a few years ago. You can now find LED lights on your smartphone screens and tablet, televisions, in outdoor decorative and landscape lighting – and many more places besides. One type of LED lighting application that is really coming along in leaps and bounds is the LED work light. Not as small as a torch or flashlight, yet – like these kinds of lights – portable and lightweight, LED work lights can be used on the job site, at home in your garage or workshop; you can take them with you on camping trips or other outdoor expeditions; you can use them as your backup emergency light at home during power-cuts, or keep in your car boot for those occasions where you break down on the roads late at night and need to repair your car. Whatever the purpose, LED work lights to do it all. Compact and lightweight, so that you can take them with you in the car wherever you go, they are also super-bright – most of them possess multiple LED pieces. The light head is usually adjustable, so you can alter the angle of the light beam generated by these lamps at will, and direct lighting to whatever part of your environment requires it the most. These lights are also in most cases fully weatherproof, so that they can be used outdoors in all climatic conditions and during all the seasons of the year – whether it is scorching summer sun, or pelting winter rains, winds, snow and sleet, these lights will stand up and be counted. You can mount LED work lights on the wall or on the ground – they usually come with some sort of stand that has rubber feet or uses magnets to prevent the light from falling over – and they also possess shock- and vibration-resistant properties that ensure they will withstand the heavy noise and vibrations generated by worksite activities. And, of course, because these lights utilize ONLY the most up-to-date and cutting-edge LED lighting technology, you can be sure that they have very low power consumption, are long-lasting, generate very little heat – and are an all-around much more environmentally friendly lighting option than the older forms of lighting technology that have traditionally dominated this market. The main thing you have to consider when choosing between the various LED work lights available on the market is whether your light is going to be battery powered, or rely on mains electricity. There are advantages and disadvantages in both options. LED work lights that run on mains electricity don’t require constant re-charging, and replacement of batteries – however, they do require access to an external power source, and this places some limitations on where you can use them (you probably can’t take them camping with you, for example). Many of them do, on the other hand, come with a several feet long power cable that gives you some flexibility as to where you position your lights. Battery powered LED work lights, on the other hand, can be used anywhere as long as the battery is fully charged – many of these lights can be charged in your car, as well as from a standard AC adaptor, so they are more suitable for trips into the wild. On the other hand, they do require regular charging, and of course, all batteries have only got a certain lifespan, so they will need to be replaced at some point. Whilst in most cases, batteries will be included with your initial LED work light purchase, unfortunately, there is no guarantee that you will be able to obtain replacements; you will have to look into whether the manufacturer of your preferred light offers replacements, and if so how easy it is to order them. You should also look at the charging time of the battery, and the running time it delivers once fully charged – both of these will affect how convenient it is for you to use a battery operated light. Another possible advantage of battery powered LED work lights is that (some of them at least) come with USB ports for external charging of your phone and other digital devices. Other things to consider when choosing an LED work light that is appropriate to your needs are the brightness of the light (measured in lumens – you should be able to find this in the product specifications listed on the box of your light of choice); how many lighting modes there are (for example dimming options, strobe and flashing modes for emergencies, and so on); and the materials your light is housed in – metal is more durable and sturdy than plastic, for instance. Also check to see whether you light has an IP waterproof rating, and what rating it is (‘IP55’ or ‘IP65’ for example). Now that we have explored what LED work lights are, their many advantages, and what you have to consider when choosing one – it is time to look at some actual lights! So without further ado, here is our list of reviews of the best LED work lights currently available on the market. 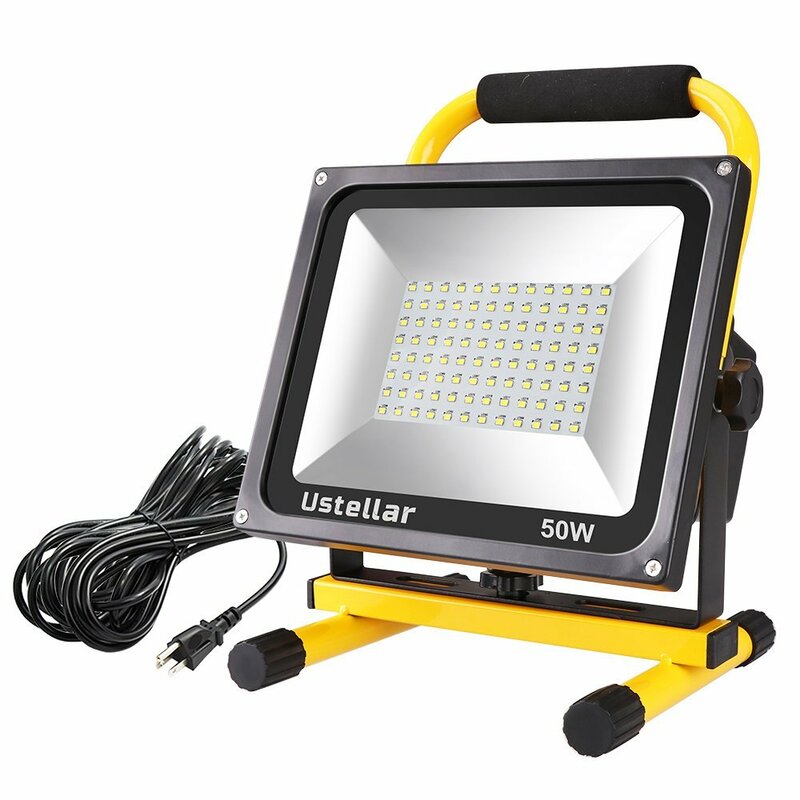 Ustellar’s 50 watt LED work light is just perfect for the construction site- or for doing small jobs at home, both inside and out of the house. With a maximum light output of 4500 lumens there will be no issues with this light’s brightness – for good measure there are two different brightness levels (full, and half brightness), that are controlled by the flick of a switch. You can also adjust the light head, 90 degrees up/down, and rotate 360 degrees left/right – giving you even more flexibility with this light. There is even a 16 foot power cable which gives you many options as to where you can position the light. IP65 waterproof, and with shock- and vibration-resistant properties, this is one light that will withstand the harshest of environments – both climactic and work-related. And because it makes use of cutting edge LED lighting technology, you can be sure it will save you plenty of money on your power bills, have a long lifespan, minimal heat output, and be good for the environment as well. Easy to install, full instructions are included in the box. All in all, if you want a work light that is effective, economical, versatile and eco-friendly, you could do a lot worse than choose this offering Urstellar, it’s one of the best products of it’s kind out there today. Highly recommended. Battery powered LED lights, suitable as work lights, camping lights, or emergency lights. 24 LED pieces, including 4 emergency SOS red lights, and three working modes. This LED light from Vaincre provides the solution to all your work lighting needs, it’s suitable for use both indoors and outside, and is compact and portable, and thus easy to transport to and from the job site. You can take it camping with you, use it to repair your car when you break down on the roads at night – or use it in any other kind of emergency. There are 24 LED pieces included with your light, including 4 red colored pieces for SOS emergency situations. The maximum light output of this rechargeable work light is 1600 lumens – apart from full brightness modes, there is also a dimming option, and strobe setting. You can even adjust the angle of your light head, 360 degrees horizontally, and 90 degrees up and down, giving you even more options. With it’s sturdy, weatherproof aluminum-alloy frame and ABS plastic handle, this light will stand up to whatever nature’s elements hurl at it. And as a battery powered light, this device requires no external power source, it already contains two built-in, fully rechargeable lithium batteries, and one 100-240 volts AC wall charger – on the other hand, there are also 2 USB output ports for charging your own devices from the light! Finally, as this is LED lighting, you can be sure that it will consume minimal power, thus saving you money, and will last far longer compared to lights that utilize older lighting technologies. Enjoy versatile and high quality work lighting with this offering from Vaincre, these guys have really hit a home run with their work lights. High performance LED work light, compact and portable, super-bright with 1100 lumens light output. It’s battery powered, and comes with it’s own in-built battery and charger. The CAT LED work light is perfect for use on the construction site or at home, both indoors and outside. Take it camping and hiking with you, use it to do car repairs when you break down out on the roads late at night, and keep it handy as your go-to portable light in emergencies. It has a maximum light output of 1100 lumens, making this an exceptionally bright light given it’s compact size. There are two lighting modes to choose from with this portable work light – full brightness, and half-brightness; choose the one that best suits your requirements. No external power source is required with this light either, it’s battery powered with it’s very own rechargeable lithium-ion battery that is built into the light. Charger is included with the light as well at no extra cost. What’s more, this cordless led work light utilizes ONLY the very latest, most cutting edge LED lighting technology, so you can be sure that it consumes minimal power (extending the lifespan of the battery because it doesn’t drain as often), is long-lasting, generates very little waste heat, and is much better for the environment compared to lamps that utilize older forms of lighting technology. As mentioned, this cordless work light is so compact that you can take it with you wherever you go. 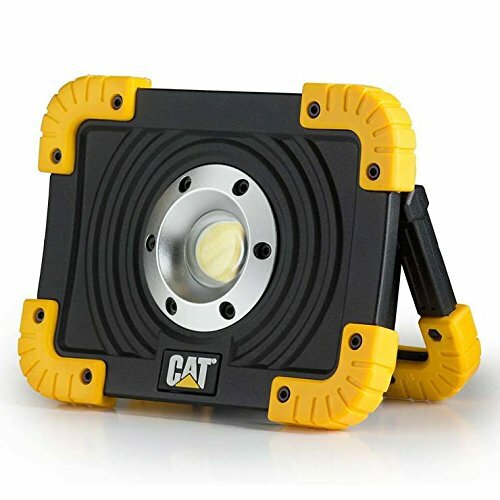 Combine that with brightness, low power consumption/affordability, and a rugged, durable design, and this offering from CAT has everything you could want in a work light. Go out and grab one for yourself today. 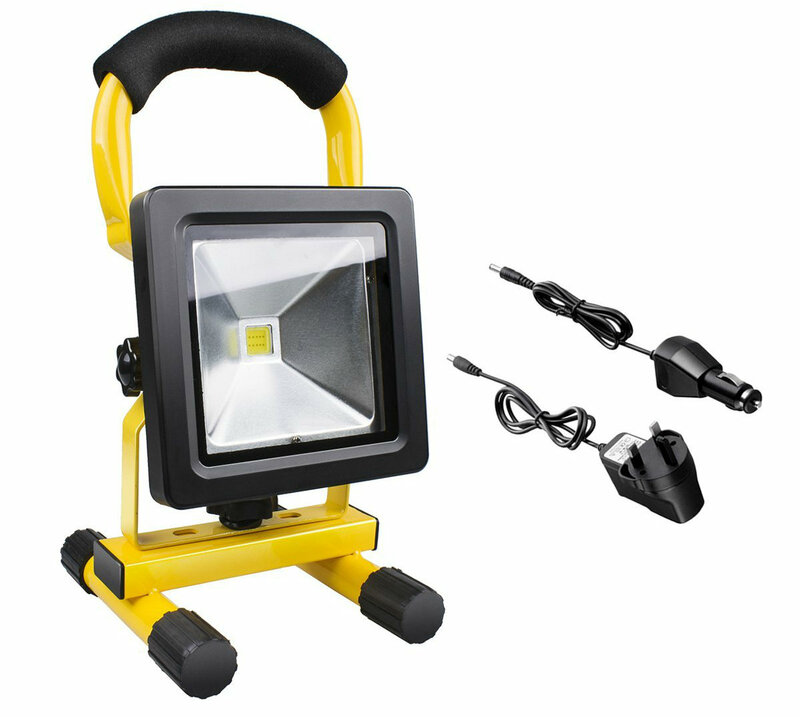 Versatile, super-bright LED work light, battery powered with car charging option included. Compact and portable you can take it with you wherever you go. This stylish work light from Morpilot is also exceptionally convenient if you want a portable little light to use on the job site, repairing your car, camping or hiking, or in emergencies. It comes with a maximal light output of 700 lumens, which is more than sufficient to illuminate even the darkest of settings. The angle of the light head can be adjusted 120 degrees along the horizontal axis, and 60 degrees along the vertical axis, enabling you to achieve more targeted, focused lighting. IP65 weatherproof rated, it will stand up under all conditions, at all times of the year- this is one portable work light you will be utilizing for many a night to come. It is also battery powered, so no external power source is required – in fact, a rechargeable lithium battery is already built into the light. Two chargers are also included, one for standard power source, one for car charging. The battery has a charging time of 4-5 hours, and delivers 3-4 hours of continuous power when it is fully charged. Easy to install, full instructions are provided – and this rechargeable led work light even comes with its own stand as well as carry handle. Best of all, it utilizes cutting edge LED lighting technology, which is energy efficient, long lasting (50,000 hours lifespan), and eco-friendly. Suitable for all sorts of situations, this LED work light from Morpilot is an essential item to have around your house. Their portable led work lights are well and truly worth the investment of time and money. LED flood light, suitable for use as a work light, emergency light, camping light and more. 2000 lumens light output and all metal, weatherproof construction. 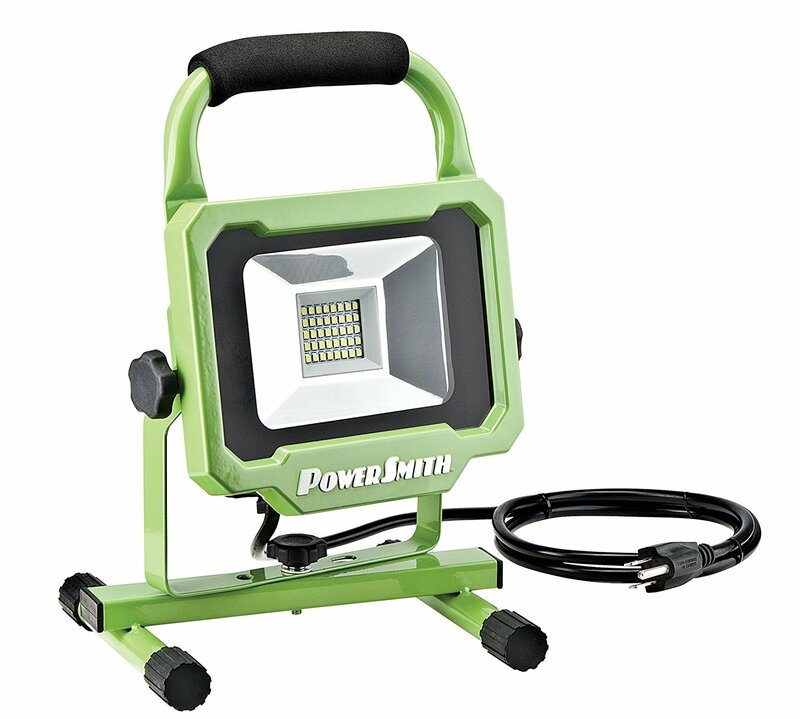 The Powersmith LED work light sets a new standard when it comes to high performing, durable, and portable work lights. This light delivers 2,000 lumens of daylight, white colored light (5000 Kelvins), making it suitable for all sorts of uses – take it with you on to the job site, use it at home for projects in the house or garden, take it camping with you, or use it as your car repair or other emergency light. Compact and lightweight, it’s super easy to move around – but the Powersmith LED work light is also tough and durable, with an all metal (aluminum) construction that is IP65 water resistant. It also has a sturdy, extra wide base giving you extra stability, and a steel handle for carrying it around with ease -or hanging from the wall. Although it is reliant on an external power source, your snap on led work light also comes with a 5 feet long power cord that gives you plenty of options as to where you position your light. And the light head is also tiltable, 30 degrees up and down, and 90 degrees left and right, giving you even greater versatility with your lighting. Finally, this light utilizes the very best, most cutting edge LED lighting technology, that is energy efficient, long lasting (this particular light has a lifespan of up to 50,000 hours), environmentally friendly, and low maintenance. Bright, cheap to run, durable – this light from Powersmith ticks all the right boxes. It’s one of the best LED work lights out there on the market today. 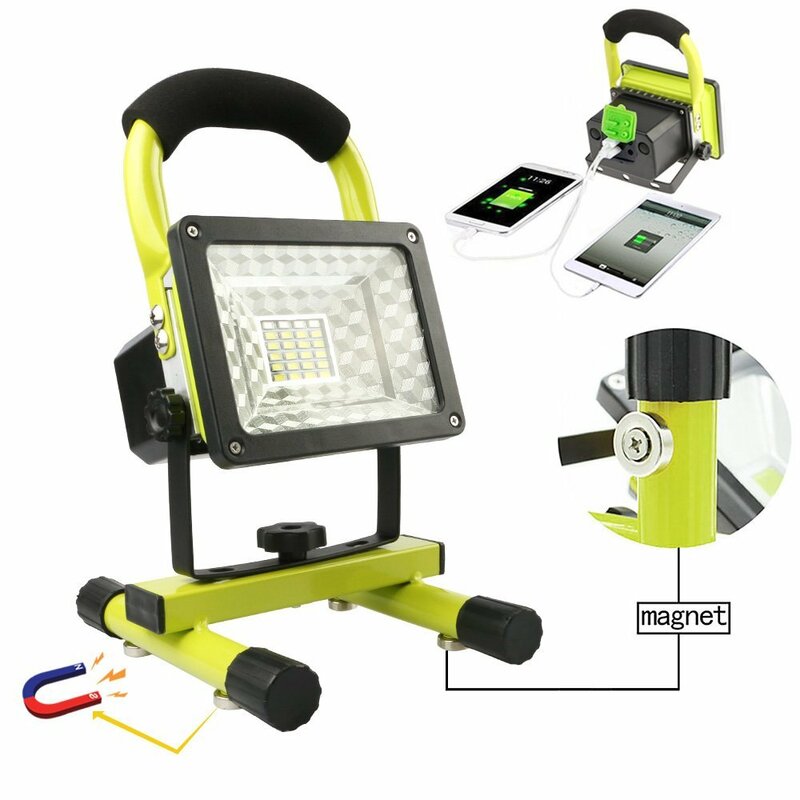 Super-bright LED work light, 3 lighting modes, battery powered. Batteries are included with USB ports included for charging your own devices.. Whether it’s for emergencies, camping and exploring the great outdoors, or simply illuminating your activities on the job site – this LED work light from Hallomall is be the light for you. It comes with 24 super-bright LEDs, bright enough to illuminate even the darkest of environments, and making it perfect for use as an emergency back-up light during power cuts. There are 3 lighting modes included here as well with this snap on led work light – high brightness, low brightness, and strobe setting, as well as a 360 degrees rotating head, which gives you plenty of options and versatility as to how you use your light. You even get 2 red and 2 blue flashing LED pieces which are ideal for roadside emergencies. Lightweight and compact design make this rechargeable led work light is easy to transport around – despite that it is also tough and durable, with all-metal (aluminum) housing that is IP65 weatherproof rated. Two built-in rechargeable lithium-ion batteries come with this portable flood light, as does a charger, and 2 USB ports for charging your smartphone and other digital devices via the battery. A stand is included for setting the cordless led work to light upon the ground, use the inbuilt carry handle to hang the light from your wall of choice. Finally, this is LED lighting, so you can be sure when buying this product that you are getting a light that is energy efficient, long lasting and good for the environment. Low heat output and minimal maintenance required. You will really appreciate Hallomall’s portable led work lights for their performance, durability, and ease of transportation – which qualities make it just perfect for use on the construction site, out in the great outdoors, or for emergencies in general. Say hello to Hallomall today! 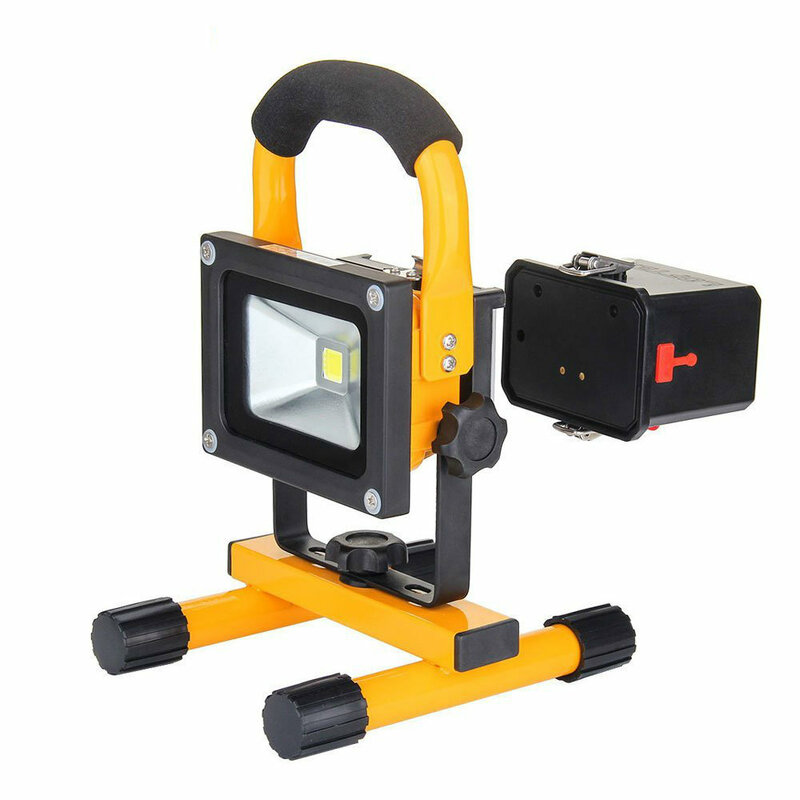 LED battery-powered work light, suitable for use on the job site, camping trips, and in emergency situations. Ideal back-up light – super-bright, compact and long lasting. BESWILL’s portable work light is suitable for work and play alike – take it with you onto the job site, or make use of it whilst enjoying a camping or hiking trip in the great outdoors; it’s even suitable as an emergency back-up or roadside car repair light – whatever the purpose, this light will get the job done. There are 24 LED pieces included with this rechargeable work light, very small but super-bright – they will illuminate even the darkest of environments. What’s more, there are 3 lighting modes included here: dim lighting mode, full brightness, and flashing for when you are in an emergency. The light head is also rotatable 90 degrees horizontally and 360 degrees vertically, which enables you to achieve more focused, targeted lighting. 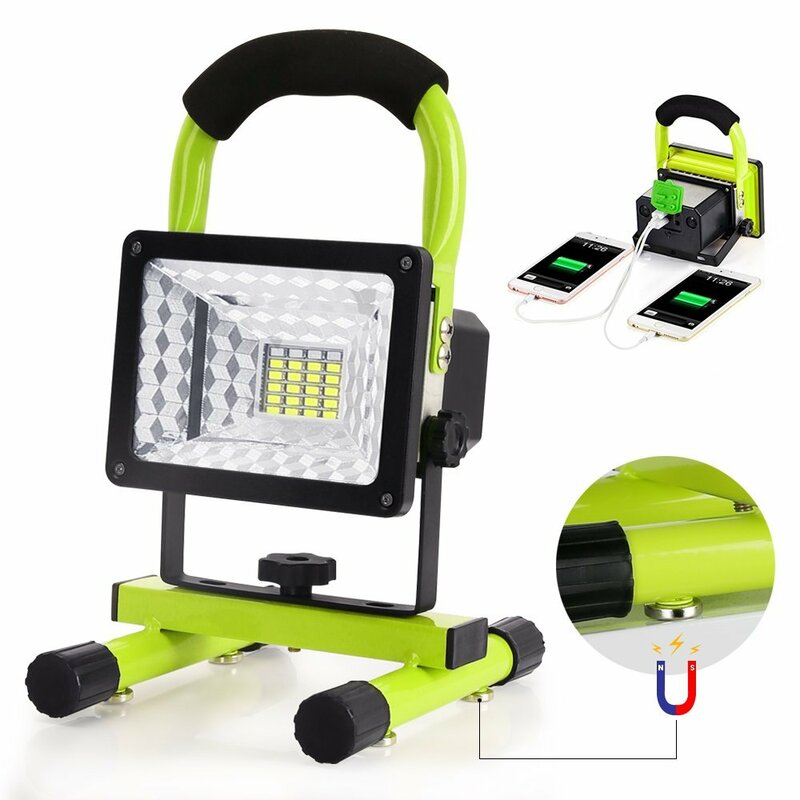 Portable and easy to move around, it’s also durable and weatherproof, so you can rely on this light to stand up under all weather conditions. The magnetic base design ensures extra stability and prevents your magnetic work light from slipping or vibrating too heavily. Two in-built, rechargeable lithium-ion batteries come with this light. You also get a charger and two USB ports for charging your own devices via the light’s battery. LED lighting technology is rapidly phasing out older forms of lighting technology due to its superior energy efficiency and longevity, and this light is a shining example of those qualities. You will be enjoying BESWILL’s portable led lights for many a night to come – no need to be constantly running out to buy replacement bulbs. High performance, versatile, portable and tough as nails – you could do a lot worse than choose this LED work light from BESWILL. Few lights compare with this one. 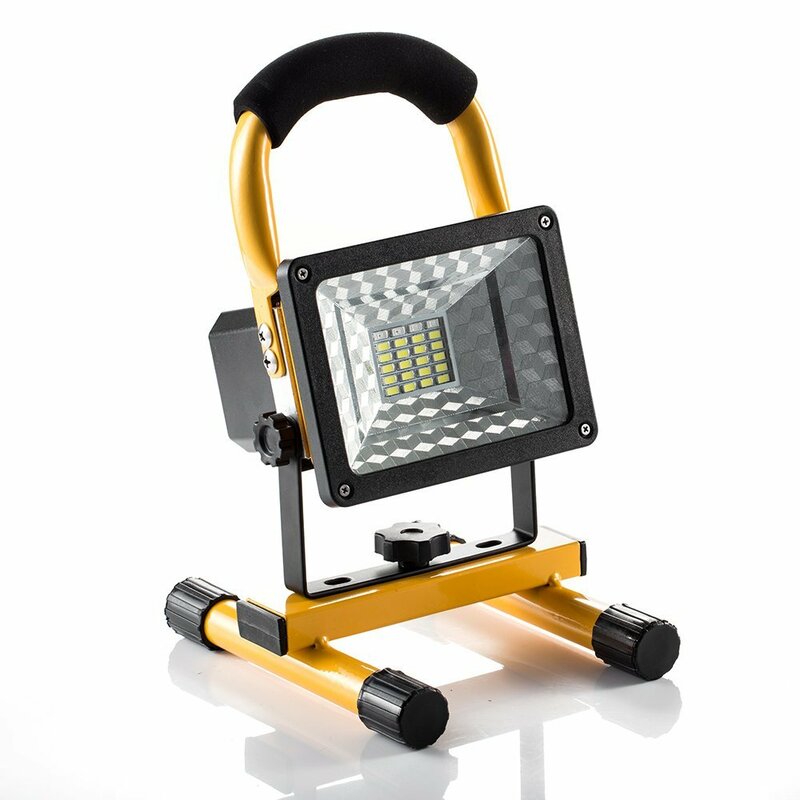 LED battery powered work light, compact and lightweight design that you can take with you wherever you go, whilst also being tough and durable. For an ultra-bright, durable outdoor light that is suitable for use on the job site, camping site, or in emergencies – you can’t go past this offering from LOFTEK. Not only is it super-bright, with a maximum lighting output of 900 lumens, it is also long-lasting; fully charged, it will deliver more than 4 hours continuous lighting – no risk of your light dying at the most inopportune of times! The 4400 mAh lithium battery is built into the light, two charging option are included, one for charging your portable work light from standard power outlets, one for car charging. But wait, there’s more! 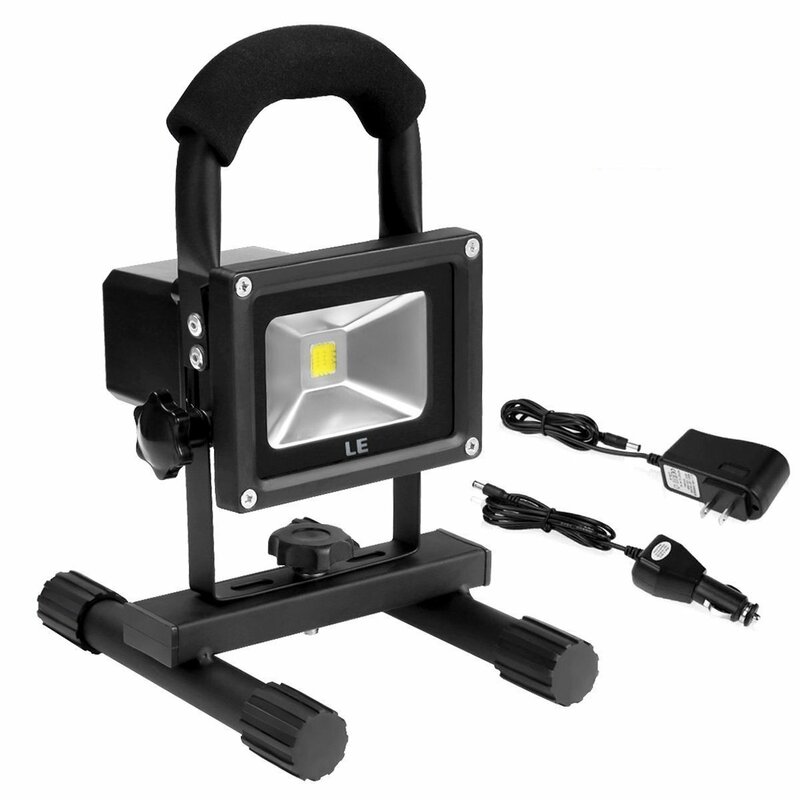 This light is simultaneously compact and lightweight (and thus easy to transport around), and tough, with durable aluminum and steel construction, and an IP65 waterproof rating, that will stand up to whatever the elements throw at it. It’s backed by a 12 months manufacturer’s warranty, which is a testament to this product’s quality and the faith the manufacturers have in it, with the company also delivering round the clock technical support should you run into any problems with your device. Finally, this is LED lighting, so you can be sure these portable lights beat most of the competition hands down when it comes to longevity, energy efficiency, low heat output, and environmental friendliness. Purchase one of these lights from LOFTEK, and you will soon be wondering how you ever did without it. It will fast become an essential part of your home toolkit. Well and truly recommended, these are some of the best portable led lights out there today. 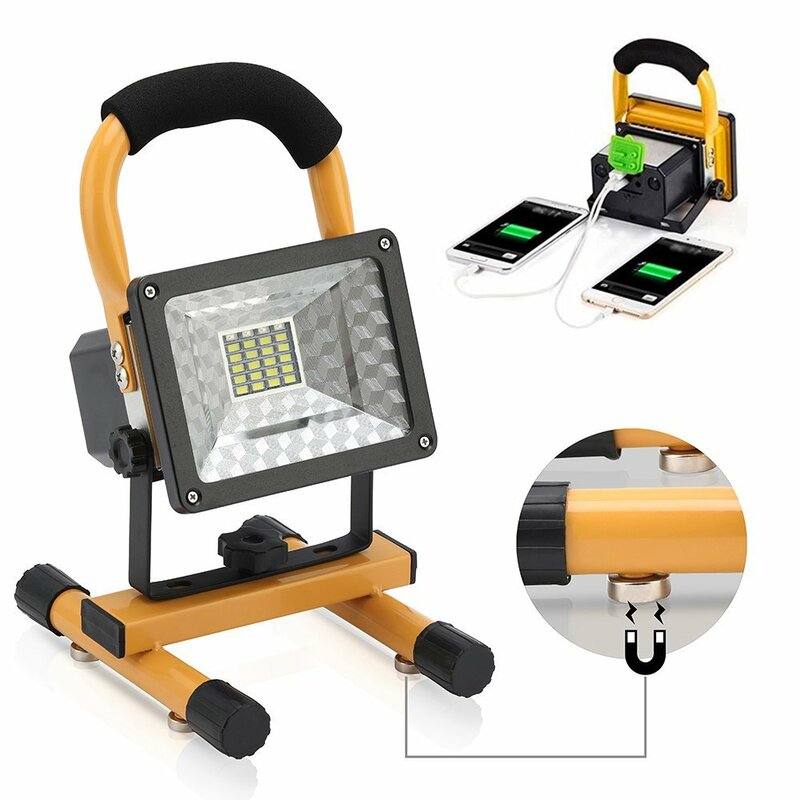 LED work light, battery powered, fast charging with long running time. Weatherproof design, it’s also compact and portable – can take with you anywhere. This battery powered outdoor light from Lighting EVER makes for an ideal work light, emergency light or camping light. This 10 watts lamp has a maximum light output of 700 lumens, and a beam angle ranging from 0 to 120 degrees, so you can direct the light to whatever corner of the surrounding environment you wish. Compact and lightweight, it’s super easy to move around – you can take it with you wherever you go – but it is also durable and tough, with aluminum and iron all-metal design, and an IP65 waterproof rating that makes it suitable for all outdoor weather conditions. The in-built 200mAh rechargeable lithium-ion battery charges quickly (within about 2 hours), whilst discharging slowly – on a full charge you will get over 3 hours’ continuous lighting from this lamp. There are also two charging option, it supports a standard 100-240 volts AC power adaptor, as well as car charging. As this is LED lighting technology, there are huge energy savings to be had here: as well as being ultra long-lasting, it is also 80% more efficient than your standard halogen or incandescent bulb. This is THE eco-friendly work light option! This offering from Lighting EVER is one versatile little light, you will marvel at the uses you can put it to. Go out and grab yours’ today. Battery powered LED work light, use it at work, around the house, on camping trips, or as an emergency back up light. Super-bright, compact and durable. Last but certainly not least in this review article we have this quality offering from Vanker. Their 15 watts, 24 LED light is suitable for use on the job site, to repair you car, to light up your camp site, or in any kind of emergency situation (eg. power cuts). It comes with 24 LEDs and has a maximal light output of 600 lumens, making it more than bright enough for just about any setting. Four of the pieces are red and blue flashing lights, that are ideal for emergency roadside scenarios. There are three lighting modes included – high brightness, low brightness, and strobe setting. Battery powered, this light comes with its own built-in lithium-ion batteries that are fully rechargeable from standard power adaptors. There also 2 external USB ports for charging your mobile phone and other devices. The battery has a charging time of 10-11 hours, and runs up to 8 hours continuously when fully charged. Rotating light head enables you to achieve more targeted, focused light, and the magnetic design base ensures greater stability and prevents your magnetic work light slipping due to work-related noises and vibrations. And as this is LED lighting, you can be sure it is far more energy efficient, long lasting – and better for the environment to boot – then most other lights out there on the market today. We’ve reviewed some really great LED work lights in this article, and Vanker’s cordless work light offering is right up there with the best of them. It constitutes a fine note on which to round out this list of reviews. In this article we have reviewed what we consider to be the best LED work lights currently on the market. There are some great little lights here – you can use them on the job site, on camping trips and other outdoor expeditions, around the house and garden, in emergency situations – the possibilities are endless. Not only that, these lights utilize cutting-edge LED lighting technology that is so much more energy efficient, long lasting AND good for the environment compared to other lights out there. So what are you waiting for! Get out there and grab one of these products for yourself today, you will soon wonder how you ever did without it.